By Scott Gilfoid: In his first defense of his newly won EBU super middleweight title James DeGale (11-1, 8 KO’s) will reportedly be facing former WBC super middleweight champion Cristian Sanavia (36-5-1, 13 KO’s) in a mandatory title defense. DeGale, 25, defeated EBU super middleweight champion Piotr Wilczewski by a 12 round majority decision last Saturday night at the Echo Arena in Liverpool, England. The judges scored it 115-113, 114-114 and 115-113 for DeGale. However, it was a poor performance from DeGale and he shoulder consider himself very lucky that he was given the decision by two of the judges, because I saw the fight as a 12 round draw. The Polish fighter won at least six rounds with his power punching. He had DeGale badly hurt on a couple of occasions and had no problems finding him with his big right hand. DeGale’s slapping punches were no match for Wilczewski much more concussive blows. 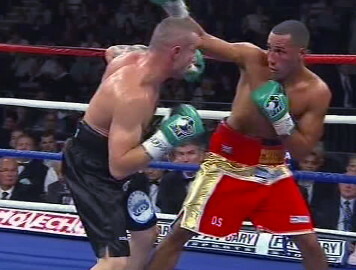 DeGale fought well at times when he was taking the fight to Wilczewski on the inside. However, whenever there was any distance between the two fighters, Wilczewski was dominating with his scorching right hands. The fight showed starkly that DeGale isn’t ready for the top fighters in the super middleweight division, not by a long shot. DeGale’s promoter is talking about DeGale fighting for a world title in three more fights. I think that’s a really bad idea because I can’t see DeGale improving enough in that short of a time to be competitive against the current champions in the division. Sanavia, 36, also previously held the European Boxing Union super middleweight title from 2007 to 2008 when he lost it in a 12 round decision loss to Karo Murat in April 2008. Sanavia fought Murat in a rematch 10 months later in 2009, and was stopped in the 10th round. Since then, it’s been easy match-making for Sanavia with him facing guys like Mariusz Biskupsi (14-13), Pavels Lotahs (5-13-1) and Armend Tatari (7-16-2) in his last three fights. This is DeGale’s mandatory challenger. Sanavia would seem to be a good safe fight for DeGale. Sanavia isn’t a puncher and that’ll make things much easier for DeGale. But Wilczewski wasn’t a puncher either and he was teeing off on DeGale all night long and was much stronger than him. DeGale doesn’t have power at super middleweight and that means he’s going to have to take a lot of shots in winning decisions. Sooner or later, his luck will run out when he’s forced to fight someone good. My advice for DeGale is to stay far away from world class fighters for the next three to four years until DeGale either grows some power or learns to fight well enough to where he’s not struggling to beat the likes of Wilczewski. Right now, DeGale doesn’t have the talent to beat the best fighters in the division and he lacks the power needed to make up for his lack of talent. What he needs is the blazing handspeed of someone like Andre Dirrell and the power of someone like Andre Ward.